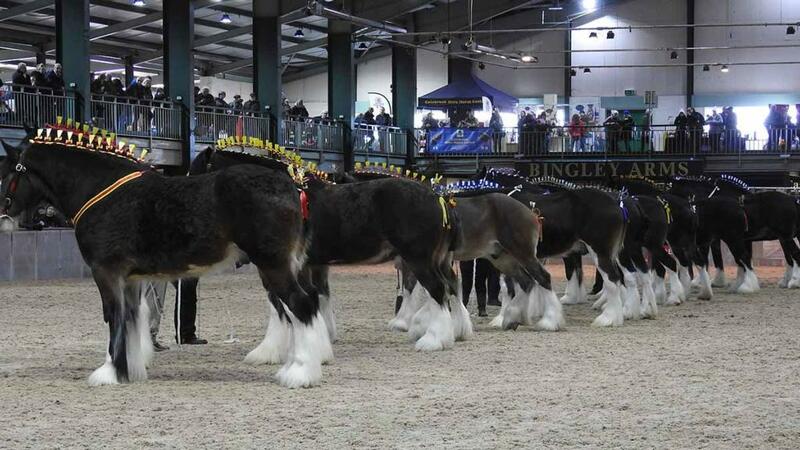 Last weekend saw fierce competition as the country’s top Shire horse breeders descended upon the Stafford County Showground to compete for some of the breed’s biggest accolades. The King George V Trophy for the champion stallion was awarded to Bill Bedford from Escrick, York with Landcliffe Charlie. This four-year-old by Martonian Norman and out of Landcliffe Wendy was reserve Shire Horse of the Year at the NEC Birmingham in October 2017. Charlie was shown in front of judges, David Worthington and Jason Holder by Bill’s brother Walt, before Bill’s son Harry celebrated his 21st birthday in style by trotting the stallion around the packed main arena on his victory lap to rapturous applause. Taking the reserve supreme stallion championship back to Derbyshire was Martin Fountain with his junior male champion, Woodhouse Rainman. 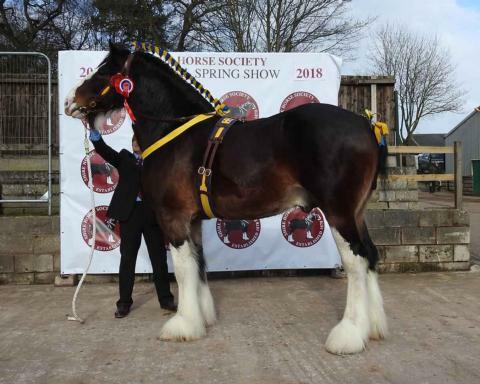 This two-year-old colt by three times Shire Horse of the Year winner, Metheringham Upton Hamlet is out of Woodhouse Calendar Girl, a mare who has won the Shire Horse of the Year final herself twice. And it was Woodhouse Calendar Girl which lifted the female championship the next day for Mr Fountain. This eight-year-old daughter of Moorfield Ted is out of Woodhouse Sunbeam. In the junior championships the three-year-old filly, Knutsford Eclipse from John Whittaker, was best junior female. By Moorfield Manor Mac out of Knutsford Ebony. Reserve junior female went to Yorkshire to Richard and Rob Bedford’s Hartcliff Imelda, a yearling filly by Rookhills Leapley Lad out of Toc Hill Victoria. Reserve junior colt was Hillmoor Trump Card, a three-year-old by Martonian Norman and out of Hillmoor Duchess exhibited by Philip Moss, Cheshire. Gelding champion was Acle Thomas from Frederic Robinson Brewery. Shown by Matthew Bedford, this four-year-old is by Bodernog Master and out of Acle Mystique. The reserve gelding title was awarded to Bromford Kingsman from Greg Rawlins. A son of Red Brae Black Jack, this three-year-old is out of Bromford Lady Diana. The turnout classes were reduced on the Sunday due to the snow but the winning trade team turnout was a unicorn from John Goodwin, while the best agricultural team was a tandem from Kurt Manders. Best agricultural implement a potato ridger from Charlotte Webb, led by Dothan Silver Coin. The award for the best single trade turnout went to Wendy Toomer-Harlow, and Walton Bomber, while best single agricultural turnout was A. Huddart, driving Hartcliff Kaiser Chief. Champion cart was John McIntyre, Ayrshire, driving Bandirran Batman.